1 Preheat oven to 350°. Line two 12-cup muffin pans with cupcake liners; set aside. 2 Beat cake mix, Hellmann's® or Best Foods® Real Mayonnaise, water and eggs in large bowl with electric mixer on low speed 30 seconds. Beat on medium speed, scraping sides occasionally, 2 minutes. Evenly pour into prepared pans. 3 Bake 18 minutes or until toothpick inserted in centers comes out clean. Cool 10 minutes on wire racks; remove from pans and cool completely. 4 Reserve 1 tablespoon vanilla frosting. Mix food coloring into remaining frosting; frost cupcakes. 5 Draw 3 circles on each cupcake with black gel. Pull through 6 to 7 lines from center of each cupcake to the edge with toothpick forming a web. Insert 8 noodles for legs into large gum drops, then attach small gum drops to large gum drops with noodle for head. Use reserved vanilla frosting to draw eyes with toothpick. 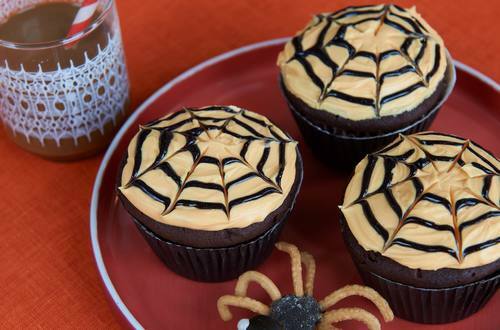 Arrange spiders on cupcakes.